Habit: Perennial herb to small tree or vine. Stem: < 3 m, generally erect; bark generally peeling as thin sheets or narrow strips. Leaf: generally simple, opposite, deciduous or not, +- hairy; stipules 0; blade +- round to narrowly elliptic, entire or toothed. Inflorescence: cyme, raceme, panicle, or flower 1, terminal or axillary, generally bracted. Flower: bisexual, radial, flowers on inflorescence margins occasionally sterile and enlarged; sepals 4--10, free or fused at base, spreading or erect; petals 4--7, free, +- round to narrowly elliptic; stamens 8--12 in 2 whorls or many and clustered, filament base linear or wide and flat; pistil 1, ovary superior to inferior, chambers 2--8, ovules 1--2 or many per chamber, placentas axile or parietal, styles 1--8, free or fused at base. Fruit: capsule, loculicidal or septicidal; styles persistent or not. Seed: generally many, small to minute, oblong to fusiform, winged or not. Genera In Family: 18 genera, +- 250 species: generally temperate, subtropical northern hemisphere; some cultivated for ornamental (Carpenteria, Hydrangea, Philadelphus). Note: Philadelphaceae in TJM (1993). Habit: Shrub < 3 m. Stem: bark red-brown, aging gray, peeling as narrow rectangles or strips; twigs glabrous to hairy. Leaf: deciduous, petioled; blade 3-veined from base, +- glabrous to hairy, margin entire to toothed. Inflorescence: flower 1, or raceme to panicle, terminal, +- open. Flower: fragrant; sepals 4--5, glabrous to hairy; petals 4--5, white; stamens generally many, clustered, filaments linear, fused at base; ovary 1/2 to completely inferior, chambers 4--5, placentas axile, ovules many, style 1, branches generally 4, stigmas linear along style branches. Fruit: becoming woody, generally loculicidal. Seed: many, generally fusiform, generally brown. Species In Genus: +- 65 species: temperate America, Eurasia. Etymology: (Greek: for Ptolemy Philadelphus, Greek king of Egypt, 309--247 BC) Note: Many intergrading infraspecific taxa described; more study needed to determine which warrant recognition. Leaf: petiole 3--8 mm; blade 20--40 mm wide, ovate, margin entire to toothed, flat. Flower: sepals 4--7 mm; petals 8--12 mm, obovate to oblong. Chromosomes: 2n=26. 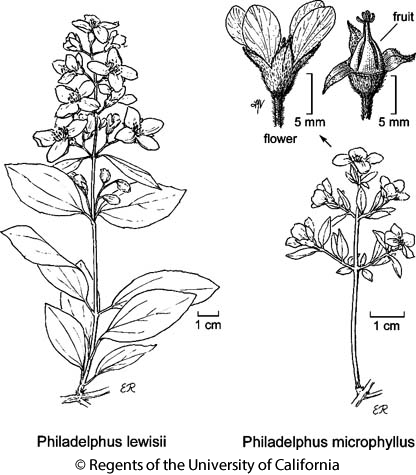 Citation for this treatment: Robert E. Preston & Charles F. Quibell 2012, Philadelphus lewisii, in Jepson Flora Project (eds.) Jepson eFlora, http://ucjeps.berkeley.edu/eflora/eflora_display.php?tid=37691, accessed on April 23, 2019. NW, CaR, n&c SN, s SNH, ScV (Sutter Buttes), SnGb, PR (Santa Ana Mtns); Markers link to CCH specimen records. Yellow markers indicate records that may provide evidence for eFlora range revision or may have georeferencing or identification issues. Purple markers indicate specimens collected from a garden, greenhouse, or other non-wild location.